Founder Dr. Kathy Hull was awarded the Minerva Award by the First Lady of California and the Classic Woman Award from Traditional Home magazine. 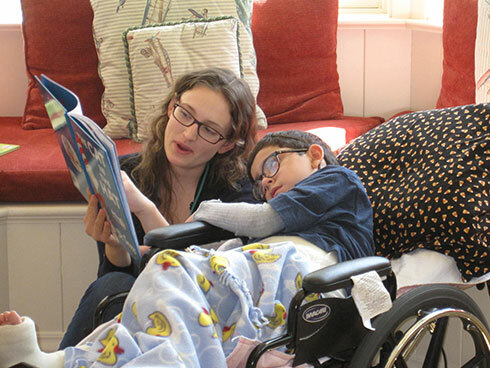 Pediatric Palliative care is specialized medical care for children with serious illnesses. The goal is to improve quality of life for both the child and the family, and help the family gain strength to carry on with daily life. It begins when a child receives a diagnosis and continues throughout the child’s illness. Pediatric palliative care is appropriate at any age and at any stage of an illness and can be provided along with treatment meant to cure. Above all, pediatric palliative care is family-centered, helping with communication and coordination of care that improves the well-being of the entire family. George Mark Children’s House was founded by Kathleen Nicholson Hull, Psy.D., a clinical psychologist from Children’s Hospital & Research Center Oakland, in California. Dr. Hull knew through firsthand experience that a life-limiting child’s diagnosis, or the death of a child, has a devastating and life-long impact on parents, siblings, extended family, and the family’s community as a whole. She felt that there was a better way for these children to get exceptional, loving care than spending time in hospitals. George Mark is named for Dr. Hull’s brothers, Mark and George, who died at the ages of 16 and 30, respectively. We hope that one day, homes like ours will become the norm. Homes like ours are well-established in the United Kingdom, Canada, Australia and Germany. Our vision—and hope—is that one day, centers like ours will become the norm in the U.S., operating in partnership with the medical community so that every child facing chronic or terminal medical conditions, as well as their families, can get the care and support they need. Get to know our care team, staff and board of directors.